The Magic And Wonder Of Christmas Christmas Cards are perfect for your holiday message. 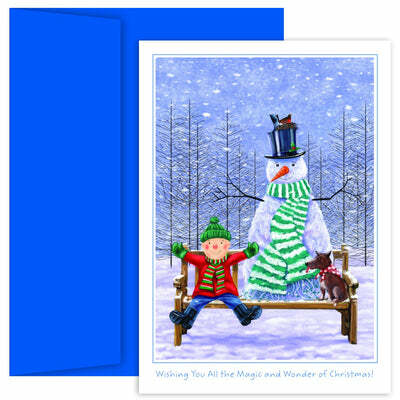 This Snowmen themed Christmas Card measures 5.625" x 7.875" and comes with solid blue envelopes.The verse inside the card, printed in Red reads "THINKING OF YOU AT CHRISTMAS TIME. WARMEST WISHES FOR A BRIGHT AND HAPPY NEW YEAR".